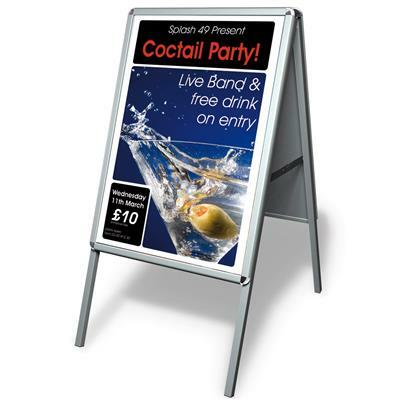 Double sided A-Board for displaying posters of A1 size, with anti-glare covers to ensure a high-quality finish. •Front opening aluminium snapframes with rounded corners for safety (32mm profile). •Anti-glare poster covers with high UV resistance. •Galvanised steel back panels, hinged locking arms and rubberised feet for optimum weight and stability. •Add print or vinyl to the back panel for messaging between poster promotions. • The ‘fold flat’ design is easy to move and store.